The Concerto delle Donne – a singing group of three ladies in the court of Alfonso d’Este in Ferrara – created quite a musical stir in late sixteenth-century Italy. This exciting Armonia Celeste program presents music from the Ferrarese court, and traces the development of the vocal chamber ensemble into the seventeenth century. 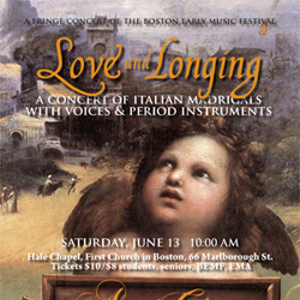 The themes of love and longing are interwoven throughout this program, much like the voices of the three ladies. The alternating textures of instrumental and vocal trios, duets, and solos give lively energy to this program of music by such composers as Luzzaschi, Rossi, Sances, and Carissimi.